Few people have even heard of this place and even fewer people have any idea where it’s located. But for those who do know and who do travel to Socotra Island, which happens to be one of the most isolated landforms on the planet, there is only one natural reaction – to wonder aloud why on earth more people aren’t visiting. Socotra Island is a part of Yemen, however, it is far removed from anything happening on the mainland. The culture is different, the language is different and unlike the mainland, which has had to deal with separatist movements, Al-Qaeda cells and a revolution over the years, life on Socotra has remained as peaceful and quiet as can be. However, almost nobody makes the distinction between Socotra and the Yemeni mainland and as a result, being a part of Yemen has kept travelers away. Rough estimates (according to several locals involved in the Socotra tourism industry) that in 2013 only about 1000 foreigners are expected to travel to Socotra. Just wait until you see the video below – that number will seem so absurdly low for a place so incredible. The island is home to approximately 50,000 inhabitants, scattered among dozens of small villages, most of whom never make it off the island. There are more goats than people, hitch-hiking is the most common form of transportation, there is no crime and there’s only one internet cafe in the capital village that acts as their connection to the outside world. This is truly a destination unlike any other and when I recently spent a few days on Socotra Island, it was the first time in my 13 years of travel that I felt as if I was on another planet altogether. It’s that magical, that bizarre, that stunning, that unbelievably remote of a destination. And that’s why more people should travel to Socotra Island! You can even fly there directly from the United Arab Emirates so that you bypass the mainland of Yemen altogether. And once there, I guarantee that you will not want to leave. Announcing the “Wander Across Socotra” Tour! I’m still working out the details but the tour, part of Wandering Earl Tours, will take place either over New Year’s (for the most unique New Year’s celebration you could possibly have anywhere) or sometime in January 2014. And since this tour will have limited space, if you might be interested, let me know so that I can add you to the list! Who wants to travel to Socotra Island??? Derek, did you know that the background music that you put to the video is of a famous Jewish-Yemenite-Israeli singer? (Ofra Haza). I was surprised and happy to listen to it! Hey Itiel – I didn’t know that when I made the video but one of my other readers told me the same thing when they heard it! Really hope you get a chance to visit at some point! I am india and interested to tour Socotra.I have a few questions. To travel to socotra it needs to be done via tour operator or it can do individually. Is there a certain tour group that is recommended for a single female traveler? Hey Nikki – I don’t know of any tour group that goes here…most people just organize their trip through a Yemen-based agency that provides the driver/guide. You could check with Eternal Yemen as they are a great company. Hey Shachina – Socotra is perfectly safe for all travelers, nothing ever happens on that island. The only thing is that you do need to use an agency to organize your transportation and accommodation on the island or else it is very difficult to move around. There is no public transportation and you’ll be very limited as to where you can go or what you can see if you don’t have a jeep with driver while on the island. Just an observation, but… there is not a *single* woman shown in this whole video. Personally, I’d love to go to Socotra, it looks great, but I doubt I’d be able to convince my fiancee. Any comment to make on this? It’s just that the women were quite shy and didn’t want to appear on video or in photos, something that is quite common throughout the Middle East given the culture. But when you’re in the villages, there were women of course and you could interact with them without any problems at all. This island is much more laid back than the mainland and foreign women could even wear swimsuits on the beach and dress in shorts and t-shirts while visiting the island and it would be fine. sorry person, but your comments are ridiculous and malicious. if you wish to live in a stone age then go and live so, but don’t impose on other people how they should live. roads are certainly not built only for the purpose of tourists but it is certainly easier for locals to go around their island on the built roads. the guide didn’t “show us a good time”, but he showed us beautiful nature spots why we actually came to visit socotra. and what is wrong that he makes money on travelers and tourists?! the local agency that we were is also employing other local people, like for example for cooking meals, lodging, guides to certain spots, drivers… and that is good, because they can earn money for their families. why do you have a job, why do you use technology, computer if you thing is so bad?! why don’t you go and live in the nature when you think it is so fantastic and romantic?! you are far off reality. person, you are totally twisting my words and you are full of prejudice about people and that is very sad. instead of constantly accusing me, you could ask questions what i mean because you are making misinterpretations. i don’t have complexes like you and i don’t think that i live superior lifestyle. obviously that people want to have island developed, roads have been built, airport has been built and our guide (local person) told us that socotra needs more tourist but the situation in yemen is stopping it. they have their own websites and facebook pages where they promote their island. also locals have built shelters and eco lodges for tourists as well as few hotels. i think that proves enough what they want and they have every right to it. if you want to live exotic life go and do it, but don’t expect other people to live like that forever so that you can come and watch them once a while for your own pleasure. Is it that obvious, though? People really want the roads built and all that? Of course your tour guide will tell you that, he makes money off of tourists such as yourself. Next time you go there (if you do), learn a little bit of the local language or even broken Arabic, and speak to the locals. Find out what they think, not the person you are paying to show you a ‘good time’. There are over 40,000 people living there, most of whom (99% I’d wager) have no idea about said facebook pages and websites, let alone know what facebook is. I’m sure to you, the most subtle of hints are proof enough to argue away whatever point you have, but most of us need a bit more evidence. When I say destroyed, I don’t mean in the literal sense. Why would you want it to get developed? Because you’ve lived a certain lifestyle that you believe to be superior and thus you want to push it upon what you consider to be a primitive island. The people living there are satisfied with their lives. Don’t push your standards on them. You are right that those type of people are found everywhere, but when I say West, I mean the Western ideology, not geographically. The American Dream spread via mass media across the world, thus its effects are found everywhere. There is a map in there that shows emotional stability across the globe. I’ve actually done studies on this, fyi. This isnt just bs. Take a sociology class, some history classes, and you’ll understand what I’m talking about. If you know me, you would know that I certainly don’t feel my lifestyle or way of thinking is superior at all. That’s quite obvious if you read a few posts on this blog. At the same time, unless you are one of the people living there, it’s not possible for you to know that they are satisfied with their lives. And from the few friends that I did make on that island, who I still keep in touch with now, they absolutely love to meet and interact with foreigners. They don’t want this so that they can earn money, they simply are interested in meeting new people from other parts of the world as it enhances their own lives, just like it enhances mine. because i simply don’t think it will get destroyed. i truly hope it can get developed and benefit locals, of course if it gets developed in a right direction (without commercial contents like casinos for example), but that will depend on the locals. we can’t expect things be frozen in time just for our own sake, because we like it so. things i like and appreciate i like to share with others and not jealously guard them to myself. i know how much i have enjoyed socotra so to those who appreciate unique and different nature i wish the same. to socotrans i wish all the best, taking care of their precious nature and scope for better development and better life. p.s. american dream is not example for me, but generalizing the west as you do is for me just a pure ignorance. emotionally and socially messed up people you will find in every corner of the world. person, i can’t agree with you. local people would like to see more tourists on their island because they are means of income for them. anyway political situation in yemen is unstable so that is already enough to keep the tourists out of the country. if you didn’t read about socotra from somebody, you would also never know about this precious place, isn’t it?! and for example iceland has also got a unique nature and is well know in the world. it has much more tourists then socotra but iceland’s beauty haven’t got destroyed. local people are the ones making rules and only they can preserve the place. I understand your sentiments, but consider that not everyone wants more income. Some people are satisfied with the way their lives are, and more money ruins them (this is actually true for most people, notice how emotionally/socially messed up the ‘West’ is thanks to ideologies like the ‘American Dream’ etc.). Considering this is the ‘information age’ and all that, especially due to social media, information spreads like wildfire. Sure, a lot of people might be afraid to go due to whatever they may think is happening in Yemen, but consider this: you tell 1 person, 1 person tells 2, 2 people share on facebook, suddenly 30 people are involved, and so on and so on until thousands are now aware. Out of those thousands, lets say a couple hundred actually decide to go. It’s called the butterfly effect I believe. Anyway, I might sound like I’m a rambling paranoid picayune, but I hope you understand that my heart is in the right place; don’t commercialize and whore out things that are dear to you, keep them a secret (if you like it so much, why would you risk destroying it?). Happy to make contact and to discover your writing. I am an Italian/British photojournalist based in Nairobi, Kenya. I am planning a trip to Socotra for a photo reportage on the island. Could you please send me your email address as I would like, if you are able to of course, to ask you a few questions in regards. Socotra is indeed a wonderful place, however, I’m going to have to disagree with your ‘go to socotra’ slogan. I’d rather hide it from the world, wouldnt you? People have a way of ruining good things. If I can give you one advice, it’s that please stop spreading the word about things that have been kept a secret from the world. Let it be a treasure to those who have come across it, and those who don’t know about it won’t know what they’re missing, thus no one is hurt. If tourists start flooding Socotra, in a generation or two your video will be a glimpse into a lost world. See what I’m saying? If you dont tell anyone about it, no one gets hurt (not in the literal sense, obviously). If you do tell people about it, maybe not right away, but in the long run people get hurt. I found out that you arranged a trip to the island. Too bad that I learned about it now. I went to Sana’a in 2007 and 2008 for business and I loved the place. I was aware of the island and I tried to squeeze in a trip to Socotra Island at the time, but I wasn’t able to. Since then I forgot about the island. Thank you for your posting on the island and hope I can join your next trip to the island. I had never heard of this place: your video was stunning. Please keep me updated as I have studied about socotra and have dreamed of visiting! hi. may i know the scheduled date of the tour on January? I would like to join the tour and visit Socotra! please could you be so kind and recommend what part of socotra island can be seen on your own, without guide and what part of socotra should be seen with the guided tour? where is the best to have a base? when you want to rent a car, must be with the local driver? do you know if it is better to fly to socotra from yemen (sana) or from UAE? many thank in advance! 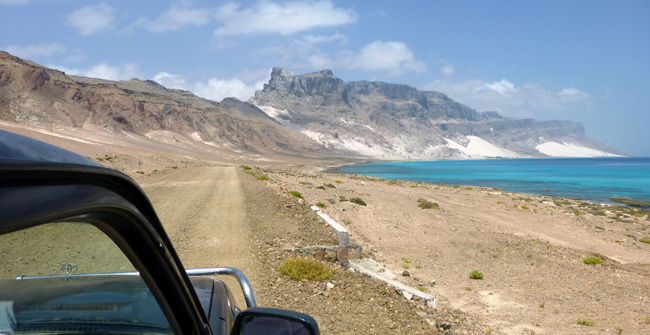 Hey Vanja – You can see all of Socotra without a guide but you’ll have a hard time getting around with a car and driver. There’s really no transportation on the island so you need your own driver if you want to reach most of the interesting sites. As for flying there, I would choose whatever is easier for you…there are flights from UAE and Sanaa, so the choice is yours! is that true? how can i verify it? Hey Dina – That’s generally what I heard as well but it wasn’t anything official. My numbers came from locals, a couple of tour operators in Yemen and a Tourist Police Office on Socotra. Everyone generally gave me the same numbers. Wow! I was researching info on Yemen and your site kept popping up, how interesting! My boyfriend and I would really love to go. Is it open to anyone or only friends you have that read this blog? Please let me know! Hey Anais – It’s open to anyone and if you wish to join the trip, please email me through the “Contact” link at the top of my blog! Hey Anais – The trip is open to anyone! Great video. My boyfriend and I are very interested in travelling to Socotra around December/January. Is the tour still going ahead? Hey Margaret – Yes, the tour is still going ahead. If you’re interested, just send me an email! Great find, awesome share and no doubt in my mind why you’re all about it. Also appreciate the details on how to reach Socotra Island and costs. As always your candor and transparency is wonderful and helpful. Hi Earl – I am starting to plan a trip to Socotra and ( may be) mainland for mid December after a short stay in Oman, being flexible about dates. Could you send me more info? A couple of things though – how expensive is it to fly to (from the US) and spend a week or so in Socotra all in? I love the camping idea vs. staying in a fancy resort. I don’t see any women in the video! It is safe for women to travel there and what do they typically wear? Probably be wise to be well covered and modest, with it being a muslim country and all. But bathing suits on the beach ok? Hey Rach – You can often find flights to Sanaa for around $800 USD return from NYC and then it’s about $400 return to Socotra Island. And for one week on the island, it all depends if you have a driver (highly recommended or else you wouldn’t get to see 75% of the island) and what kind of accommodation you want. I would budget for around $60 – $75 USD per day on the island for everything. As for women, they were quite shy and usually didn’t want to be filmed or photographed but it’s quite relaxed there. There is no crime on the island at all so it’s perfectly safe for everyone. And you wouldn’t have to be as covered up as you would think. Even shorts and t-shirts would work for females on Socotra. I wouldn’t wear a swimsuit on a beach full of locals but every beach I went to was completely empty, so that’s not really an issue either. What’s your current assessment of the security situation for tourism if reaching Socotra thru Sanaa? Thanks. Hey Mark – I was just in touch this morning with my contact in Sana’a and according to her and her contacts, the situation hasn’t changed at all in Sana’a. Life is as normal, especially in the Old City. She said that there are still visitors coming in and it’s been fine for them during their couple of days in the city. Bahahahahahaha!! Nice touch with the fish and goat. I am completely blown away by the video you compiled, would have totally come along. At 1900$, I would have totally come along had the Indian Rupee not taken such a tumbling :P. Anyway, I have been following your blog and fb page for quite sometime now, can’t wait to join you on one of the trips. I see that you are doing an India Tour, what sort of places you plan to cover? If you ever plan for the Upper reaches of Sikkim or McLeodganj in Himanchal, I’d love to join you..!! Cheers!! Hey Sidharth – I’m still working on the itinerary for the next India tour but it will most likely take place in the north, so we will visit Himachal Pradesh and definitely McLeod Ganj. Hey, love the video, already had Yemen and Socotra on the list of places I want to visit in the coming years, and would love for you to put me on the list for the tour in Jan 2014! Hope it won’t be too expensive though, as I am a student and would be on a very tight budget, but hopefully being such an intrepid traveller you’d know all about budgeting! ha! Great video, and really enjoying reading your blog which I only found today..
Hey Marina – I’ve just sent you an email with the details about the tour, and while it’s not the cheapest of tours (since Socotra is such an isolated island, everything is quite expensive there), it’s absolutely going to be one of the most memorable! Hi Earl, was wondering whether to trust all the stuff in the news about drone strikes. Had a look at the british embassy website and it said about how lots of the carriers aren’t flying there. Are you still planning your trip? I’m interested to see Yemen while it is still relatively unspoiled . Cheers. Hey Ben – Yes, the trip is still going ahead as Socotra Island is far from the mainland and is a peaceful, very safe destinations. And with the mainland, the drone strikes are concentrated in certain regions of the country and the Yemeni government doesn’t let foreigners go anywhere deemed unsafe. Is the mainland 100% safe? No. But the areas that any tour operator would allow you to visit are definitely areas where foreigners are welcomed and have a very low risk of anything happening. I am constantly amazed at how human beings survive in the most desolate areas. I kept looking for small gardens beside the humble dwellings. I didn’t see anything in your video people could eat other than a goat. No wonder there is a rumor about cannibalism! Just curious. I am sure there are markets in the urban area for fresh fruit and vegetables. What are there resources? They should have plenty of seafood. I know I am rambling, but like I said I am just curious. Hey Janet – There isn’t any urban areas. The ‘capital’ of the island is just a big village with mostly dirt roads and apart from a few fruit/vegetable stands, there isn’t much. I believe that such produce comes in on ships from the mainland or UAE. But the diet mainly consists of fish and goat. This is awesome. I ran into Socotra a while ago and checked it on Google Maps – It looked A-M-A-Z-I-N-G! I have never before seen such amazing paradise photos. It also seemed abandoned, like no one lives there.. I got itchy feet straight ahead but I never traveled this part of the world, so I still carry prejudice about the danger with Somalian pirates and the general shaky situation in the area. Definitely good to hear there are straight flights skipping those parts. Hope it doesnt cost a fortune? How did you find out about it and decided to go? Would you say it is convenient for solo girl travelers? Hey Ninna – The flights aren’t too bad, about $250 – $350 USD roundtrip from Sanaa or Dubai I believe. I had heard about the island from a friend of mine a couple of years ago and ever since, I’ve wanted to go. And I had some free time this April, so I made it happen. And it is perfectly fine for solo female travelers. The island is completely laid-back and there is no crime on the island at all…you will be treated very well over there. As for cannibals, I don’t think that’s the case…definitely a rumor. The people live simple lives but they are not like a remote jungle tribe that has no connection at all with civilization! Please add me on the list for this trip! You have me hooked… I can’t wait to hear more details. Hey Alison – You are now on the list!! Hi! I have found this wonderful website of yours some time ago and have been thoroughly entertained by all the tales and adventures you wrote about — or, at any rate, the ones I have already read! It is lucky that I just found your page by accident. I’ve always dreamed about traveling around the world just like you. I’m a little bit scared but I started searching for the ways I can work in the other countries first. As far as I know our country(South Korea) banned to travel to Yemen right now. How about America? Then, how did you visit this country? Our country has mindblowing beaches and mountains, and we have our own 5000 years of tradition too! Hey Soy – Welcome to the site! As for Yemen, I don’t think any country is banned from going there. It is just that many countries warn citizens not to go. But you can still go. And yes, I would love to visit Korea at some point in the near future. I’ll get there! Holy amazeballs. Thanks for bringing this little-known destination to my attention…I’d certainly never heard of it before. Definitely add me to the tour info list- I’ve been toying with the idea of visiting Yeman on a tour someday anyway! Hey Megan – Amazeballs it is, believe me! You are now on the tour list and I’ll be emailing you with more details soon. Great video!! My friend and I visited Socotra about two months ago, I recognized many locations! That was a crazy road up to Homhil. Hey Jen – You are now on the list and I shall email you soon with more details! But I WANT to see mainland Yemen as well, I hope that’s included. Sign me up. Hey Missy – What I’m going to do is offer an optional post-Socotra trip around the Yemen mainland for those who want using the driver and guide I had. You are now on the list and I will email you soon with details! just wanted to say how much you inspire me. I used to get frustrated of not having a dream in terms of what I wanted to do with my future, but lately there is this growing feeling of sheer excitement thinking of the prospect of being able to live a life of travel like you. I always come and read your funny stories if I’m having a bad day and reading about your adventures makes me dream of someday starting my own. I think it’s worth it in the end of it all, looking back at life and thinking ‘wow that was amazing, wish I could live it all again’ and thats what you’re doing. You’re so brave and inspirational. I’m also writing so I can go back at this at a moment when my hopes of pursuing this life style are low so I can give myself a little push in the direction I want to go. Thanks Earl. Read an article about Socotra a few years ago in the NY Times and while the images stuck with me the name didn’t. I think I have told a few people since I wanted to go to “that island somewhere off Africa and Yemen or something that’s real isolated with unique trees or something”. Glad to know I know where I want to go now, man. Thanks for that. Not one woman telling me to “Go to Socotra” in your video Earl. Any reason or are there not any on the island? The fish was funny and might be enough for me. Hey Patty – There are indeed women on the island but as it is a Muslim country, the women we met on the island did not want to have their photos taken or be on camera. This is quite common in the Middle East. But the fish wasn’t shy at all! Okay, now I defenitely want to go there! Added to my list of countries/places I want to visit. Thank you for showing me this! I always like to search for quite and stunning places, wandering and finding wonders. It is difficult to be fully satisfied with where you are, and I mean fully fully satisfied, so much places are amazing, but some of them have these special feeling. I experienced it once, in Malta. Sitting on a mountain top, Tas-Salvatur, Marsalforn, Gozo. I felt amazing there. So since then I’m hoping to find more places like it. And I hope I can visit Socotra Island in the future and hope to be stunned by this place too. Hey Guusje – You’ll get there and you won’t be disappointed! Its been on my radar for a while so we might be up for the tour over the New Year. Keep us informed Earl. Great video. Hey Paul – I shall definitely keep you informed once the details are all set! A Yemeni local at 1:22 ? Hey Andrew – You look more local once you start chewing those damn leaves. Absolutely stunning! The fact that you can bypass the mainland of Yemen is a real plus for Socotra. Your video just put this place on my list of places I want to visit. Can’t say when I’d be visiting though. It would probably be some years from now, after I visit New Zealand, South-East Asia and South America but I definitely want to go there one day. I’d love to know the ins and outs of how to get to Socotra, visas and the cost of say a 14 day stay and what there is to do there. Will you be covering all of this in a future post? Ha! I ALREADY wanted to go to Socotra and even featured it on my blog last fall as one of my dream destinations. Loved your video – it looks like your trip was not only amazing, but a lot of fun. I’m probably too old and out of shape to hang out with you, but put me on the contact list for your tour anyway. I am very interested. Wow! It’s so interesting how someplace so small and overlooked by the rest of the world contains so much hidden beauty. The shapes of the trees are so unique! The water looks beautiful. Although if I lived there, I don’t think I would be able to stand staying there for the rest of my life! Certainly looks like an amazing place to visit! Hey Sara – I don’t think many outsiders could live on that island permanently…that would be tough to move to such an isolated place. Very beautiful. I can see why you feel in love with it. Those blue waters and white sands are very inviting looking. May be another place to add to the travel list. Hey Kimmy – Yes, those beaches are some of the most beautiful I have ever seen anywhere on this planet and already I can’t wait to get back there. The difference between visiting Yeman and Oman is incredible, isn’t it? And, yet, they are right next to each other. Great video! Hey Julie – Two different worlds, completely! Oh – and great video Earl – Lilabak Allah 🙂 Makes me want to return to the island! Hey Julie – That is the case although I did learn that some Emirati investors have already bought huge plots of land and are planning to build some major resorts on Socotra. So let’s hope that doesn’t affect things too much. Yes! to Socotra Island! I would love to join the tour. So please keep me informed as to when, and all the details. WOW… I watched the video 3 times. It made me smile, and laugh… and yearn….. Looking forward to this trip…..
Hey Carol – You are now on the list as well and I will email you soon with more details! Hey Mina – Well, since there are less than 1000 people visiting each year, the chances of it changing to rapidly are quite low I’d imagine. It will probably take some time to increase those numbers significantly, which would certainly change the island to some degree. Go there as soon as you can! Hey Queenie – Perhaps you should!